As an avid Civil War relic collector, I rely on numerous websites for research purposes and for acquiring new pieces for my collection. I would like to share a few of those with you; 9 of them to be exact. It’s my hope that you’ll discover (or rediscover) at least a few new sites to frequent after reading this post. First and foremost, this list isn’t exactly fair. 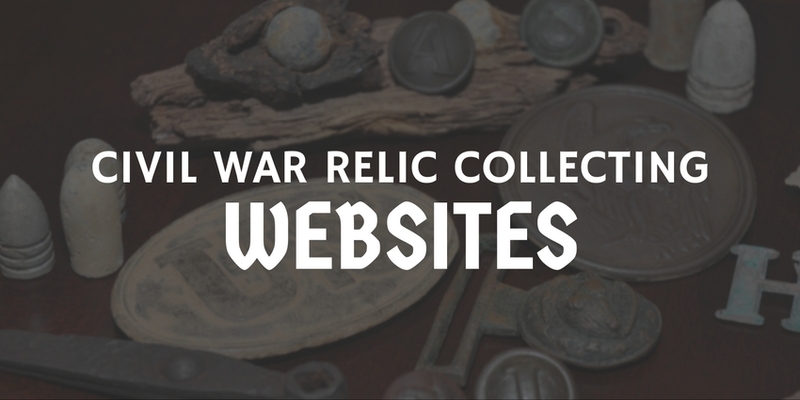 It doesn’t represent every Civil War artifact related website, nor does it do justice to all of the great people that are involved in this wonderful hobby. To keep the list manageable, a few conditions had to be met for a site to make the list. And it’s my list so I can do what I want! Owned and operated by relic hunting pioneer Larry Hicklen, Middle Tennessee Civil War Relics offers a steady stream of mid-to-upper tier Civil War artifacts. As one of the most trusted and respected people you will find in the hobby, rest assured that each and every artifact presented for sale has been personally authenticated by Larry. A traditional businessman, Larry only accepts money orders, cashier’s checks, or personal checks for payment. To purchase an item from midtenrelics.com, just shoot Larry an email or practice the long lost art of picking up the phone and talking! If you’re serious about collecting, this is one guy you want to have on speed-dial! As a side note, I purchased my first Civil War artifact from Larry nearly 30 years ago while visiting his shop. The only difference between now and then is that I’m a little older and Larry’s “patina” has grown more mature! Aggressively updated with a wide assortment of Civil War artifacts, Sgt. Riker’s Civil War Trading Post has something for every collector, at every budget. The website is well organized by artifact genre, helping a visitor quickly locate the types of things they’re most interested in. 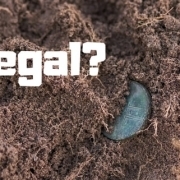 Like most in the business, owner Ransom Hundley got started in the hobby as a metal detecting enthusiast before he began sharing artifacts with others. Such field experience inherently translates into a more knowledgeable dealer; and that, Ran is! To purchase an item from sgtriker.com, you must email or call to verify that the item is still available and to arrange for payment. Purchases can be made over the phone via credit card, through PayPal, or by traditional means (check). Tip: As with most online shops, emailing or calling ahead is always good practice, as many items may be for sale in other venues such as antique malls, Civil War shows, or online auction sites. An early disciple of Larry Hicklen, Rafael Eledge has grown into a formidable force within the Civil War artifact space, both as a dealer, an appraiser, and consultant. In 2009, Rafael made the decision to close his popular brick-and-mortar shop in favor of an online store. It was a move that seems to have worked. Over the years, shilohrelics.com has grown into one of the largest online sources for Civil War artifacts; connecting passionate collectors with an amazing assortment of artifacts from single bullets to museum quality pieces. Rafael has transcended the tightknit community of Civil War artifact collectors by sharing his knowledge with millions of Antique Roadshow viewers, where he appraises various Civil War artifacts for the show. Shiloh Relics is one of the few websites that offers online checkout, making it a destination for the “have to have it now” collector! And for those that create an online account, past purchases are stored for future reference. 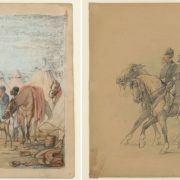 Not only will visitors of joshuasattic.com have the opportunity to explore and purchase items from a large inventory of Civil War artifacts, they will also have the chance to learn about this amazing period in American history through the Joshua’s Attic Civil War Cyberspace Museum. Joshua’s Attic approaches artifact categorization with a meticulous touch. Visitors may choose from a dropdown menu that categorizes artifacts by battle or by artifact type (i.e. artillery). If you visit the site often, the New Arrivals section provides a quick update to recently added inventory. The vast majority of the items are accompanied by detailed descriptions and multiple images. And if you dig deep enough into their inventory, you’ll find some humor woven into various item descriptions. Joshua’s Attic also offers the convenience of online checkout via PayPal, but if you prefer to go the old fashion way (money order, personal check, etc. ), they can accommodate. One of the nicest, most sincere guys in the hobby, Tom Hays serves up a steady stream of interesting artifacts through an easily-navigable website, stonesrivertrading.com. Raised on the family farm a few miles from the Stones River Battlefield (TN), Tom grew up around Civil War history and the artifacts left behind. Not to mention, his father, veteran relic dealer Bill Hays, did the raising! Tom offers quality relics from recently dug “smalls” to high-end, rare artifacts such as Confederate plates and buttons. Unlike other sites, Tom offers a smaller, well curated selection. This ensures that you don’t have to sift through a bunch of so-so relics just to get to the good stuff! To inquire or purchase an item from stonesrivertrading.com, you must email or call Tom. I would suggest the later, as you’ll enjoy spending a few moments getting to know such a great guy! North Carolina Civil War Relics primarily deals in what I would consider museum grade Civil War artifacts. Visitors to Allen Gaskins’ site, nccivilwarrelics.com will be treated to some of the most pristine and rare artifacts offered for sale online. The site is easily navigable, features multiple, high resolution photos, along with plenty of written details for each item. Like so many other’s in this business, Allen has long been an avid student of Civil War history and has metal detected Civil War sites for more than four decades. This, in addition to viewing and touching thousands of artifacts over the years, makes Allen a go-to source for authenticated and rare artifacts. Due to the rarity and sticker prices of his inventory, Allen only accepts payment via check (checks that clear of course!). One of the most beautifully produced websites of the bunch; Nick Periut’s site leverages stunning photography to capture every detail, in every artifact offered for sale. This site primarily deals in museum quality artifacts, offering collectors the chance to own some of the finest and most sought after relics from the Civil War. Most collectors do not have the financial luxury of amassing a Confederate belt buckle collection. And most rarely have the opportunity to study such buckles up close. I’ve often found myself using armyoftennesseerelics.com to closely examine such artifacts. Thanks to Nick’s use of crystal clear, high resolution photography, I have the opportunity to familiarize myself with a variety of high grade artifacts. And when you’re ready to step up and dig deep into your wallet to shell out the clams that a dream worthy artifact will command, this site is a great place to start your search. Army of Tennessee Civil War Artifacts accepts traditional forms of payment (checks) along with PayPal and credit cards (via phone). 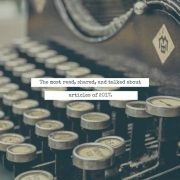 By far, this website offers the most extensive and free research library found online. And that’s in addition to an assortment of some killer artifacts for sale! The site is owned and operated by Harry Ridgeway – a renowned collector whose items have been featured in many Civil War reference works. Mr. Ridgeway should be applauded for sharing such knowledge and for investing the time and expense in doing so. To me and other buyers that I know, this work hasn’t gone unnoticed. Through his dedication to education, I purchase with extreme confidence knowing that relicman.com offers authentic artifacts backed by Mr. Ridgeway’s experience and personal guarantee. 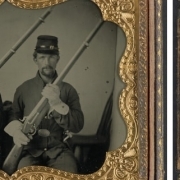 Most collectors of Civil War relics start (and continue) their collections with “smalls” – items that are physically small and typically inexpensive (relatively speaking). The most common “smalls” to a relic collector come in the form of Civil War bullets. And for those that love collecting bullets, look no further than Ken Price’s website, tennesseelead.com. The website features an expansive, high quality assortment of Civil War lead (bullets) – from the most common to the rarest varieties. For those who are sticklers for references, each listing includes the widely accepted “Mason & McKee” reference number for documented Civil War projectiles. Like many of the sites listed above, Tennessee Lead accepts traditional forms of payment (checks) and PayPal. As mentioned earlier in this article, this list isn’t fair. There are so many awesome people, websites, forums, and magazines dedicated to the hobby of Civil War artifact collecting. To help us show some love to those that didn’t make the list, let us know of a few sites that made your list!